I only graduated college 8 years ago, but hindsight is 20/20. There are already so many things I wish I could go back and tell that excited, slightly terrified new college graduate. When you’re fresh out of college, many times you’re just hoping to land a decent job, and that was definitely the case for me. I was fresh out of college with an English Degree, had zero job prospects, and there was an impending economic crash to boot. Needless to say, my bright ambition from my collegiate days definitely dimmed a bit when reality hit me in the face that summer. I made the same mistakes that so many new graduates do, and I cringe when I see others doing it as well. I bought financed a new (to me) car, moved to a nicer, more expensive apartment, and I proceeded to blow the remainder of my money with no budget in mind, or much thought to my future. If I had money in my checking account, it wouldn’t be there long, and I didn’t think about my finances from one paycheck to the next. If the money was in my account and I wanted something, then I went out and bought it. I had nothing to my name, not even my own car, and I basically had no clue what an IRA or 401k was, nor did I care at that point. I had a lot of growing to do, financially speaking. Like many others, I learned many of my financial lessons the hard way. The good news is that you don’t have to make the same mistakes I and so many countless other new graduates have made. You can learn the easy way. 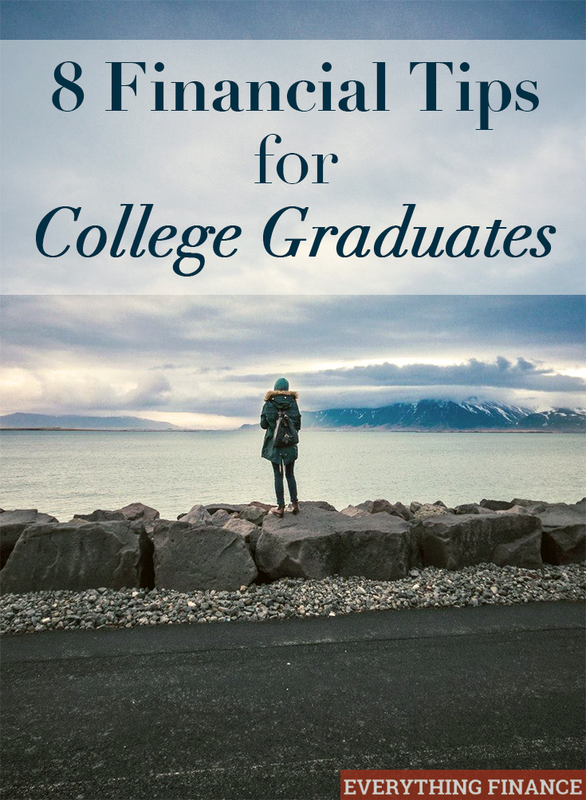 Here are my top 8 financial tips for graduates. If you have to move back in with mom and dad for a few months after graduation (even a year), don’t beat yourself up about it. Get away with it while you still can, and use it as a great financial opportunity to save money on rent, build a sizable emergency fund, max out that new 401(k), or start paying down that student loan debt. As long as mom and dad are okay with you being home for a bit longer, there’s no shame in it. You’ll be out before you know it anyway. Try to consider how much dough you could bank if you lived at home for a mere six months. I was lucky enough to avoid student loan debt completely for various reasons, but I’ve had friends who had enough student loans that they didn’t even know how much they owed once they graduated. I don’t exactly know how you can bury your head in the sand that far, but don’t be that person. Even if it’s hard to look at, sit down and add up all your student loan debt so you can figure out a way to fit it into your budget. If you have too many payments, consider refinancing or consolidating them into one lump sum or to get a better interest rate. The hardest part about landing a job fresh out of college is not having a lot of experience to include on your resume, but you likely have more than you realize. Consider the kinds of skills your ideal employer is seeking and highlight any of those you might have obtained while working on campus as a student worker, an intern, a tutor, or even through volunteer work. Just because you were paid nothing (or very little) to do certain jobs as a student doesn’t mean you didn’t learn valuable skills. Prominently emphasize those skills on your resume to show that you would make a valuable asset to any company. You’re probably used to living the life of a broke college student, so try to keep up your frugal habits to save money so you can start your post-grad life off well. Living like you’re still broke doesn’t have to be permanent, but if you’ve already been saving money like a champ, why stop now? Stay away from that keeping up with the Joneses mentality while you can. Congratulate your new coworkers on their brand new (probably financed) BMWs, and then remind yourself that you don’t want to be that person who sets yourself up for debt the rest of your life (or even for the next five years). If you can continue to drive your beat up car (or, even better, ride your bike), and save that money rather than blow it on a down payment for something shiny, you’ll be setting yourself up for a much better financial life than those acquaintances who blow unearned money like that. Remind yourself of that daily if you must. Once you do land that new job, start a budget or, at the very least, track your spending. If you’ve never done it, now is the perfect time to start, right when you’re expecting that first big paycheck. Getting that first paycheck is exciting (or sometimes humbling, depending on how you look at it), but it’s an important time to realize your new earning potential. You don’t want to go crazy and burn through those first few checks on frivolous things. Put that new income to good use by utilizing a budget. If you aren’t sure where to start, there are plenty of resources online to help you decide the best way to do it, and there are so many different ways to track your finances. Once it’s all set up, you won’t have to do much outside of entering a few numbers, so you really have no excuse. You’ve probably heard this before, but that’s only because it’s so very important. I bet if you ask anyone who graduated 20, 30, or 40 years ago what they wish they’d done sooner, it would be this — open a 401(k) or IRA as soon as possible after graduation. The best decision you can make for yourself right now (and for your future once you land a new job) is to open up your first 401(k) plan. Many companies offer them today and though it’s not as favorable as a pension, it’s still a very wise idea to start yours today. Not tomorrow, not a few months from now, but today, or the very first day you start that new job. When you meet with human resources, it should be one of the first things you take care of. Hopefully your new company will offer a match, so if you can’t afford to max out your 401(k) on a rookie salary, at the very least contribute up to your company’s match (usually 3%-6%). No investments offer a 100% guaranteed return right off the bat, but that’s essentially what a 401k company match is — a guaranteed dollar-for-dollar return on your money. You’d be foolish to not take advantage of that. To get an idea of what this match can do for you (especially if you’re 22 and fresh out of college), tap a few numbers into a compounding interest calculator to see how much wealth you can build with a minimum investment today. The results are staggering if you start young, and you can literally build your nest egg while you’re sleeping. Seeing potential earnings makes dumping a small percentage of your paycheck into your IRA seem not so bad after all. If you set it up now, before you even get that first pay check, you won’t even miss the money. I promise. You can finance anything these days — cars, credit cards, a new TV, a boat, a motorcycle, even clothes or a dog. But please don’t take on more consumer debt just to try to sustain a certain lifestyle. Avoid the mall and car lots if you have to, and try to fend off that ever-present need to buy new things to keep yourself from getting into consumer debt as a new graduate. If you can’t afford to pay for something with cash, then don’t make that purchase, period. It’s not worth strapping yourself with future debt, especially when you land your first real job. If you buy that new car or that fancy new wardrobe today, chances are you’ll be tired of all of it 6 months from now, but you’ll still be paying for it. Is that new car smell really worth it? Just don’t. Really, don’t. Credit cards aren’t free money. You’ll be paying for purchases long after the newness of them has worn off. It’s not worth the monthly payment. If you”re a new graduate, congratulations! You’ve worked hard to get where you are. Now that you’re starting a new life and career, make the effort now to establish yourself financially so you can rule your finances rather than let your finances rule you. You’ll thank yourself later.